Boot up your computer, and it won’t be long till your past catches up with you. You’ve got some tough decisions to make! Recently, I received a ‘hello’ through a social media site. From someone I once knew thirty years ago. Isn’t the web so amazing to facilitate such a moment? And this potential micro-reunion from my past isn’t the only one I’ve received. Nor is it the most distant. The one that takes the prize is from someone I once knew at my sleep-away camp when I was twelve. Actually… it’s a little freaky. How are you supposed to respond to these jolting moments that seemingly crack the very fabric of time? Your past is back there for a reason. But the concern over how to handle a potential virtual reunion doesn’t apply when fate brings you face-to-face with your past. If you run into someone you once knew, you have to deal with it right there. Say you go to your school reunion and realize a great new connection with someone you barely remember. That would be called serendipity, right? Of course, the difference here is the face-to-face exchange is moderated by the human construct known as fate. You give yourself a lot of leeway when you feel fate may be pulling the strings. Plus the real time interaction provides the platform for you to cognitively process this unlikely event. It’s a natural decompression chamber of sorts for your brain, allowing for the normal catch up process to occur. It only takes a few seconds for your noggin to update its native ‘Friending app’ and bingo, you’re tickled with the realization you’ve just found yourself a new (old) friend. But all of this can’t occur via the Web. That unlikely “How are you doing?” message of fifty-three characters from someone you once knew is poorly filtered by dated info locked in your brain’s basement. It’s like a message in a bottle that washes up. And that organic chip in your head can’t decide what to do with these words that simultaneously connect to both your past and present. We all have a past. And unless, you’re running for public office, the availability of those details usually remains under your control. Everyone’s personal history contains some detail you generally choose not to share with a broader audience. And so you don’t. You’ve got that information tucked away in your head, and you move about the cabin of your life freely. Then social networking sites popped up. And all of us who never knew a world without this amazing resource are having their entire lives digitally documented. Your relationships, friends, and activities…there for all to see. And even if you ‘Unfriend’ someone or take down a photo, aren’t you a little concerned there’s always some digital trail? Plus most everyone is now only a Google search away. So moving forward, everyone will efficiently carry around their entire lives through their Facebook friends‘ list or whatever social network website is hot. Some of my peers try really hard to stay out of the Web’s reach. Yes, I think it’s a generational thing. They just don’t trust the Web. All of these analog creatures have done just fine without their lives plastered over the Web. Why change a good thing? They just want to control your access to their personal data, which everyone else is apparently sharing freely online with the world. But there are also many of us who’ve lived through the old analog days and now have successfully made the transition. We’ve freely integrated the Web in our lives to communicate and share. Yes, I’m a card-carrying member… usually. No, I’m not afraid to admit it. There is little more to say about how Facebook has already transformed our society. That said, I think Transitionals are a unique group of people who have quietly struggled with this mega social shift. As a Transitional, you may pretend that you’re like everyone else. You’ve got big time baggage that makes your Facebook experience unique. It shouldn’t be a big deal to accept a Friend Request, right? It’s supposed to be easy. But often, it’s not, because your past is a complicated place. Today’s younger generation will never experience losing touch with someone for decades. Because every personal connection they’ve ever made will never be lost, however dormant that name may remain in their digital address book. But a Friend Request sent to a Transitional can point way back into the 20th century. That inevitably forces a significant decision. We Transitionals are the last of humanity who will experience the joy when a long lost friend ‘likes’ your online post or feel that low-grade nausea when a classmate from high school you barely tolerated wants to Friend you a quarter century later. But what’s up with ‘liking’ something? In the old days, you were in touch with someone, or you weren’t. You made a phone call or you didn’t. You sent a letter/email. Or not. Now you can manage much of your communication these days with just one click of your mouse. But finally, I understand how clever it really is. It takes no effort. It’s barely anything at all. But it demonstrates your thumbs up. Support. Agreement. And, of course, the amassing of ‘likes’ in our social media-centric society has huge value. It harnesses the great power of public opinion. That’s true with global business brands, and on a smaller scale when someone posts a photo of their cat doing something cute. It says that people are paying attention to you. Maybe time to buy some stock. So I’m not sure how much of this helps with my dilemma of whether to reconnect with near-strangers from my distant past knocking on my virtual door with a little a Web hello. Just because the Internet can easily bring back someone from your past, should you just click away and accept? Perhaps you should at least acknowledge what life sends your way. Anything otherwise would be disrespectful. And besides, the concept of linear time is such a human concept. Or maybe you delete the invite. Because the lure of fate doesn’t apply when something so previously impossible is now so common. Is the totality of your past really a thing of your past for good reason? Would you make the same choices? 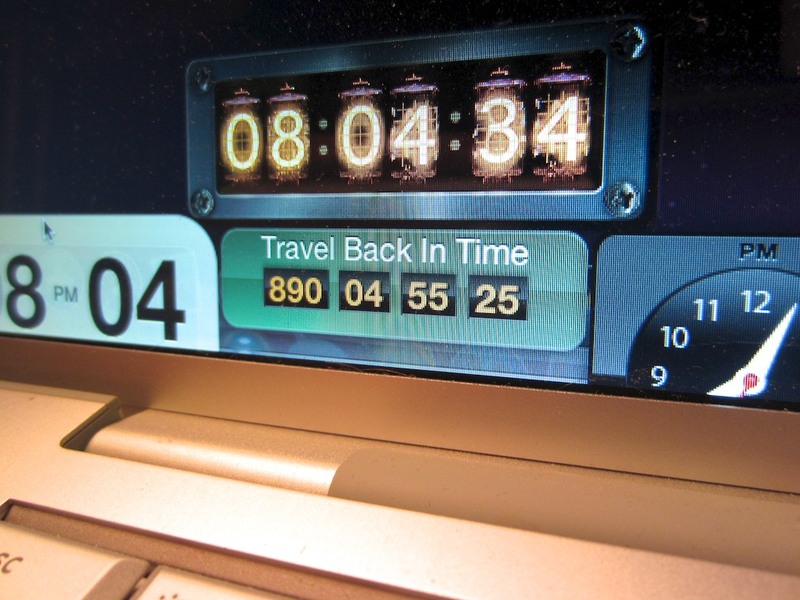 Is your laptop a time machine?